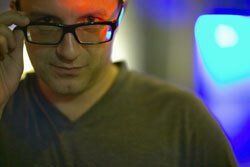 Ever since the founding of Plus 8 Records with partner Richie Hawtin in 1989 and the fame and success that came with it , John Acquaviva has been a driving force in the international music and club scene. Well known for his vast record collection of over 50.000 pieces of vinyl, spanning virtually the entire length of club music history AND having played through it as well, he is acknowledged by many as a DJ's DJ. Recent projects include the development and introduction of Finalscratch.